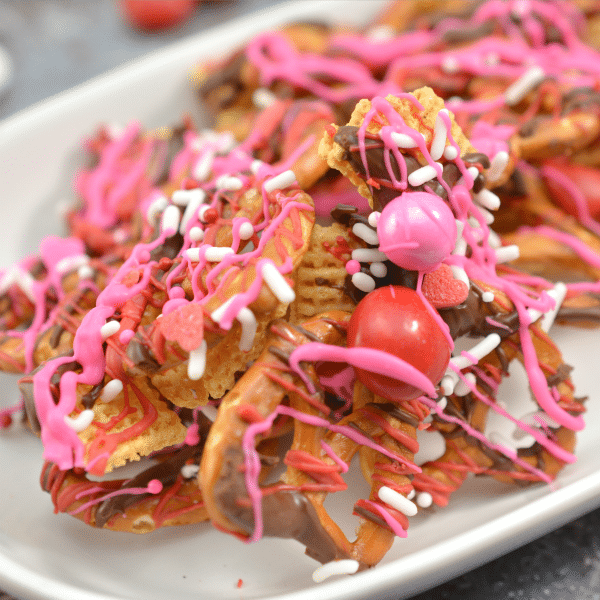 Valentine Bark is a beautiful and festive treat for Valentine’s Day. This easy holiday dessert is perfect for class parties, gift bags or on a platter at a party. There are SO many fun desserts to make for Valentine’s Day. I guess a holiday about love has to have sweets, right? Sweets go hand in hand with Valentine’s Day. 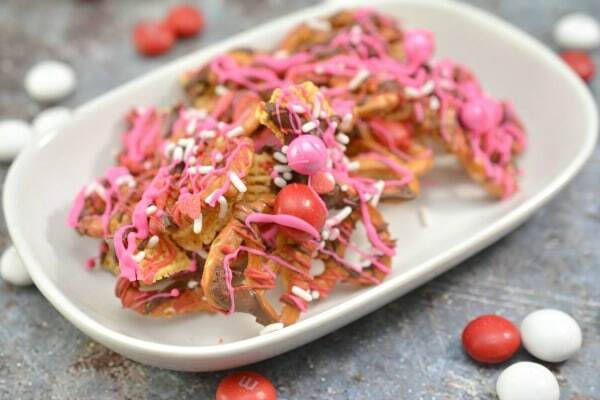 Valentine Bark is a a treat with a twist. It isn’t just a traditional sweet dessert. It is a crunchy snack mix that combines sweet and salty. Sweet salty treats are my favorite kind of treat. I can get overwhelmed by too much sugar and the pretzels in this recipe help offset the sweet content. Valentine Bark snack bags are such an easy way to share this delicious mix. I am always looking for easy ideas for my daughter’s class parties. Schools today seem to prefer individually bagged snack items for holiday parties. This Valentine Bark is so easy to divide into cute Valentine bags . I tie the bags with bright red, pink and white ribbons and it is ready to send to school. These Valentine Bark snack bags are also perfect to take along to work and hand out to coworkers. Valentine Bark contains some basic ingredients you will find in a lot of sweet and salty snack mixes. A lot of these ingredients I already had in my cabinet. Chex cereal –your choice of corn, rice, wheat, etc. This is such a simple recipe. There is no baking involved. If you have a microwave and can melt and stir then you can make this recipe in no time! The first step is to prepare the baking sheet . Line a baking sheet with wax paper and then spread the Chex cereal and mini pretzels over the wax paper. Place the chocolate chips in a microwave safe bowl. Melt the chocolate chips in the microwave on defrost for 1 minute. Stir the chocolate chips and continue to heat on defrost in 30 second increments until smooth and melted. Drizzle the melted chocolate over the Chex cereal and pretzels using a fork. Now it is time to melt the red candy melts. Place the red candy melts into a microwave safe bowl. Microwave the red candy melts on defrost for 1 minute and then stir. Continue cooking on defrost in 30 second increments until melted and smooth. Drizzle the red candy melts over the Chex cereal and pretzels. 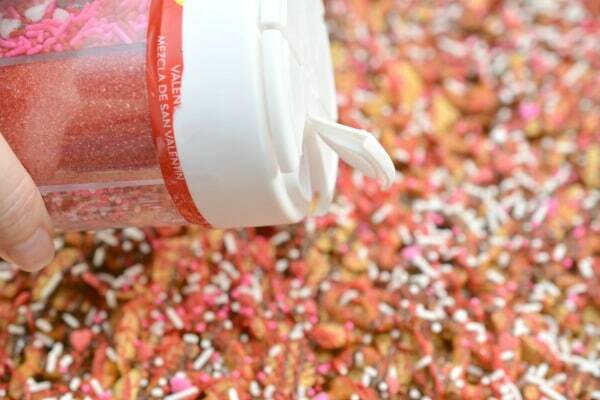 Sprinkle some Valentine’s themed sprinkles over the mixture. 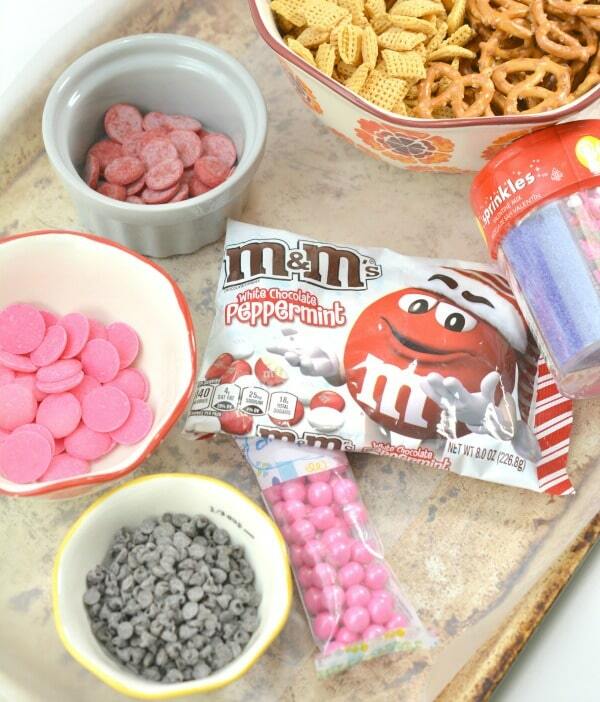 Add some red and white M&M candies and the pink colored candies over the top of the Chex cereal and pretzel mixture. Try to do the sprinkling before the red candy melts have totally hardened. Repeat the same melting procedure with the pink candy melts. When the pink candy melts are smooth and melted go ahead and drizzle over the mixture on the baking sheet. The last (and hardest) step is to WAIT until the whole mixture is set up and the candy melts have hardened. Once the mixture is hard it is time to gently break it up into pieces and store in an airtight container. You can download and print off the Valentine Bark recipe below. This is such a great recipe to make year after year. 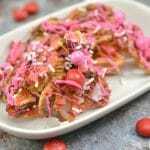 Valentine Bark is an easy crunchy, sweet and salty snack for Valentine's Day. Melt the chocolate chips on the defrost setting on your microwave for 1 minute. Stir, and then heat at the same setting for 30 second intervals until completely melted. 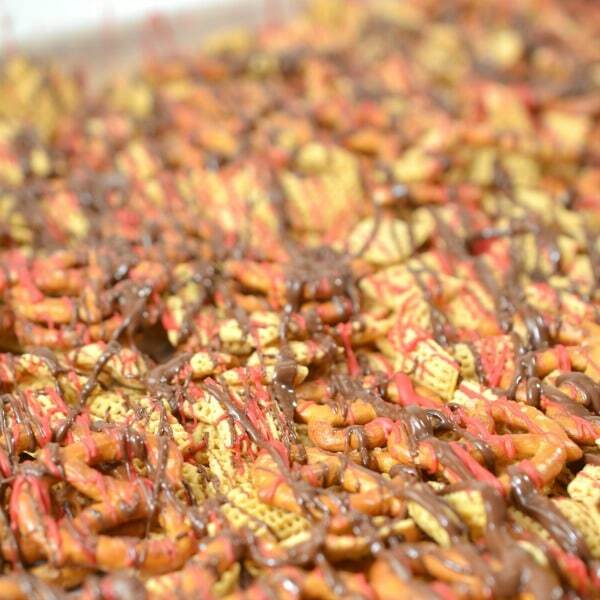 Use a fork to drizzle the chocolate over the combined Chex cereal and pretzels. Heat the red candy melts in the microwave on the defrost setting for 1 minute. Take them out and stir them, and then reheat at the same setting for 30 seconds at a time until completely melted. Drizzle the melted red candy over the pretzels and cereal. 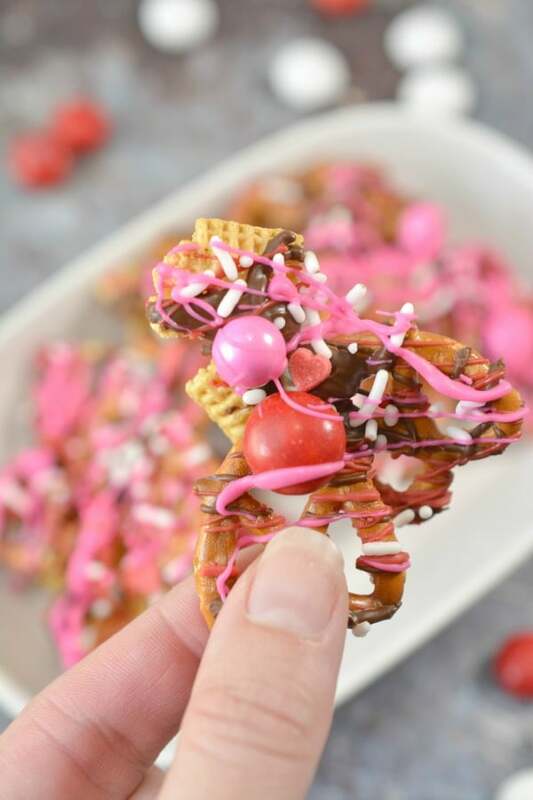 Sprinkle some red and white M&M’s and pink colored candies over the surface of the bark. Melt the pink candy melts in the microwave using the instructions above. 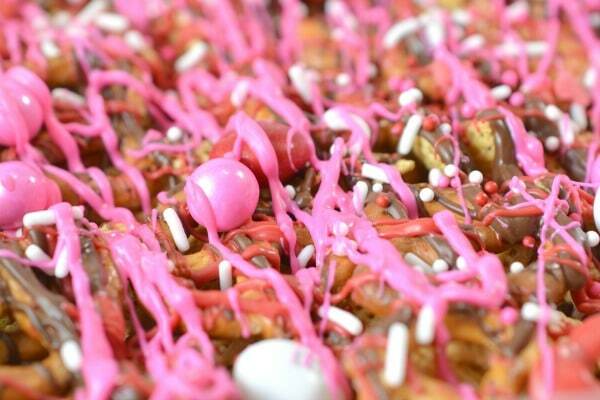 Once melted, drizzle the pink candy all over the top of the surface of the treat bark. 10. Allow the candy to harden, and then gently break it into pieces. Store in an airtight container or serve immediately. You can adjust the amount of candy melts and chocolate chips based on your personal preference. If you need some more Valentine’s Day dessert recipe inspiration be sure to check these ideas out! Don’t forget to PIN this recipe for future use! 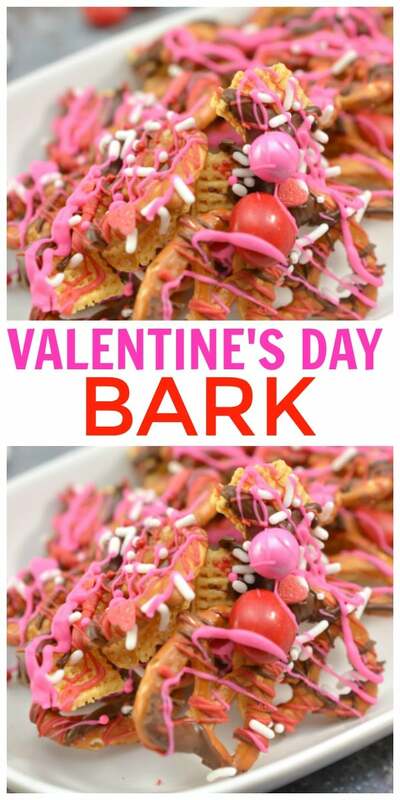 Your Valentine Bark looks fantastic! Hope you are having a great week and thanks so much for sharing your awesome recipe with us at Full Plate Thursday! I love making this type of treats. So simple and so tasty. Thanks for sharing on MM. Pinned. What a lovely idea! Your bark looks delicious! Thank you for sharing at Fiesta Friday! This looks yummy! The perfect combination of crunchy and sweet. Pinned. The bark looks great! Didn’t you make the nutter butter snowmen?